Jessie and Chris had a busy year in 2016. They were newlyweds learning the ins and outs of marriage, and Jessie had just started a brand-new job. Those two changes alone are a lot to take on in a single year, but they also managed to pay off their debt, too! Not long after their discussion, Jessie stumbled upon EveryDollar. Once they started to focus on their spending and budgeting, they realized they needed to pay off their debt and get their money on track. They had already built up some savings, which they immediately decided to put toward paying off their debt. From there, it was time to buckle down and focus all their energy on getting rid of their payments. The couple ended up celebrating their financial independence on Independence Day! 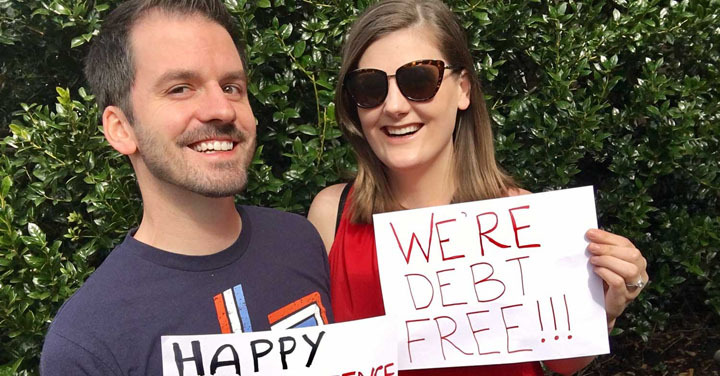 Now Jessie and Chris not only have a full emergency fund, but they’re saving for a down payment on a home they can call their own. They’re grateful to have found a budget tool that worked for them. And they credit a lot of their success to the fact they can use EveryDollar to see exactly what they’re spending and how much they’re saving. They found a way to make it fun, too! Rather than having formal budget meetings, Jessie and Chris call their monthly budget meetings “money dates.” They may go out to a restaurant, or maybe even cozy up at home with a nice dinner and a glass of wine as they talk about their goals for the upcoming month. Long-term goals are important to these two. That’s one of the reasons Jessie decided to start building a capsule wardrobe—a smaller, intentional wardrobe with pieces that mix and match. The more Jessie thought about it, the more she decided to give the capsule wardrobe a try. She said it helped to realize clothes weren’t going to make her happy in the long run. Instead, she would rather focus on her family’s bigger goals. “I think I had $300 a month going toward clothes at one point,” she said. Now she might set aside $50 a month for clothes. That’s a savings of $250 a month! And instead of buying anything that stands out, she focuses on items that she can mix and match with pieces she already owns. “It’s much more simple, it’s easier to get dressed in the morning, and it saves a ton of money,” she explained. If Jessie had to give advice, she says she would tell people to focus on their goals and dreams first, and then think about what they need to do to achieve those things.